Here are the most recent dehumidifiers. The current best dehumidifier 2019 is the TOSOT GDN50BA-A3EBA2B and the 2nd-best model is the TOSOT GDN30AZ-A3EBA2C. Here is the full top 10 list, followed by special categories and, finally, a complete list of dehumidifier brands and models. Considering this dehumidifier's aggregate ranking of 92%, we believe that the TOSOT GDN50BA-A3EBA2B is, as of now, Alphachooser's best dehumidifier 2019. Furthermore, we think that our sample of 254 reviews from our sources gives us a high confidence level (more on confidence levels) that pushes us to call it a "no-brainer best choice." With its 4.5 stars computed from 233 reviews, here is second best dehumidifier. * These choices are based on a full analysis of hundreds of dehumidifier reviews from across the web. 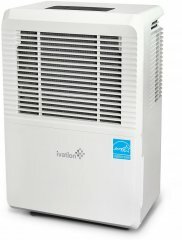 The Ivation IVALDHG70P is the newest Ivation dehumidifier. The Ebac RM4500 is the latest Ebac dehumidifier. 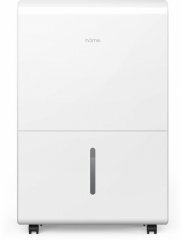 The Danby DDR095BDPWDB is the newest dehumidifier by Danby. The SoleusAir DME-95IP-01 is the newest model by SoleusAir. The Frigidaire FGAC7044U1 is the latest model by Frigidaire. The Whynter RPD-503SP is the latest Whynter dehumidifier. The Hisense DH100TP1WG is the newest dehumidifier by Hisense. The AlorAir Storm LGR Extreme is the newest dehumidifier by AlorAir. The Honeywell DR120 is the newest Honeywell model. The Perfect Aire 2PACD200 is the latest dehumidifier by Perfect Aire. The Active Air AADHC70P is the newest dehumidifier by Active Air. The Compact Air Plus 4033610 is the latest Santa Fe dehumidifier. The Arctic King Midea AKDL-95PT6 is the latest Arctic King one. 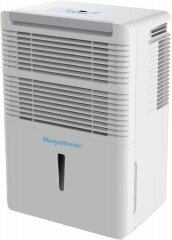 The Keystone KSTAD707A is the latest dehumidifier by Keystone. The Homasy GEHM019AW is the latest Homasy one. The Eva-Dry 2200 is the newest model by Eva-Dry. The Ecoseb DD122EA SIMPLE is the latest Ecoseb one. The Gurin DMD210V is the newest Gurin dehumidifier. The Black and Decker BDT45WT is the latest Black And Decker model. All Black And Decker dehumidifiers. The Dri-Eaz F412 is the latest Dri-Eaz one. The Powilling Thermo-electric 106oz is the newest Powilling one. The Friedrich D70BPA is the newest Friedrich model. The GE ADEL30LW is the latest GE one. The Haier HEN30ET is the newest Haier one. The Royal Sovereign RDH-330 is the latest model by Royal Sovereign. The DeLonghi DD50PE is the latest model by DeLonghi. The EPD 250CR is the latest Fantech dehumidifier. The Eurgeen OL10-009D is the newest Eurgeen dehumidifier. The Bionaire BD20S-BM is the latest Bionaire dehumidifier. The Aprilaire 1870F is the latest Aprilaire one. The Impecca IDM-70SE is the newest dehumidifier by Impecca. The EdgeStar DEP701WP is the newest EdgeStar model. The Whirlpool WHAD701AW is the latest Whirlpool one. The Kenmore KM70 is the latest Kenmore one. The TOSOT GDN30AZ-A3EBA2C is the newest TOSOT one. The Inofia CFT4-0D is the latest model by Inofia. The Yaufey 163A is the newest Yaufey dehumidifier. The Sunpentown SD-72PE is the latest SPT model. The RCA RDH505 is the latest dehumidifier by RCA. The Comforday HH214 is the latest Comforday model. The Maytag M3DH30B2A is the latest Maytag dehumidifier. The Lagute L-A03 is the latest Lagute one. The KEDSUM SYNCHKG100006 is the newest KEDSUM model. The Horizon Titan XP90 is the latest Horizon model. The Pro Breeze PB-03-US is the latest dehumidifier by Pro Breeze. The Comfort Aire BHDP-95-H is the newest model by Comfort Aire. The hOmeLabs HME020031N is the newest model by hOmeLabs. The Emerson EAD70EP1 is the newest Emerson dehumidifier. The Garrison 2477822 is the newest dehumidifier by Garrison. The Pure Enrichment PEDEHLRG is the latest dehumidifier by Pure Enrichment. The KAIKING B074T9J226 is the newest KAIKING one. The Mounto MT80 is the latest Mounto one. The Afloia B073XKC49V is the latest model by Afloia. The Manzoku AX2-1 is the newest dehumidifier by Manzoku.